Do you use your pressure cooker for breakfast? If not you will now! 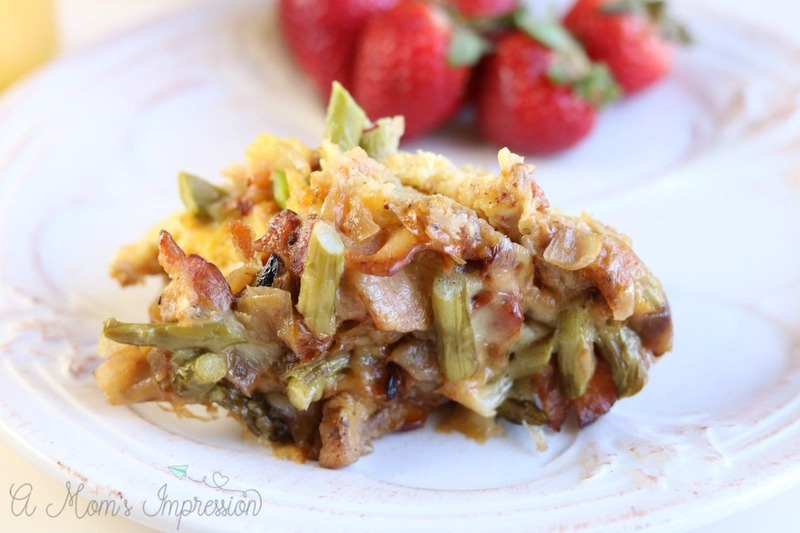 This Instant Pot Breakfast Casserole with Bacon, Asparagus, and Caramelized Onions looks amazing and tastes just as good. I love that it’s so easy and has healthy ingredients. I use my Instant Pot for just about everything I can these days. 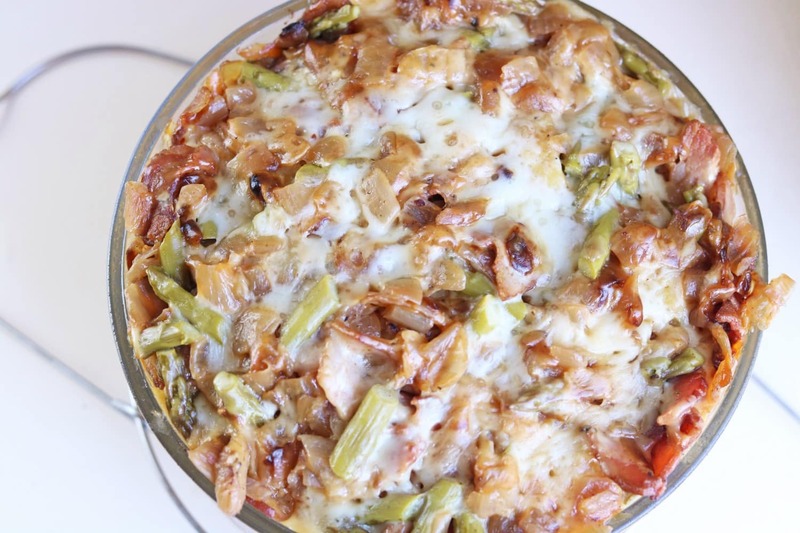 It is a busy mom’s dream to just have one pot to clean up after every meal. 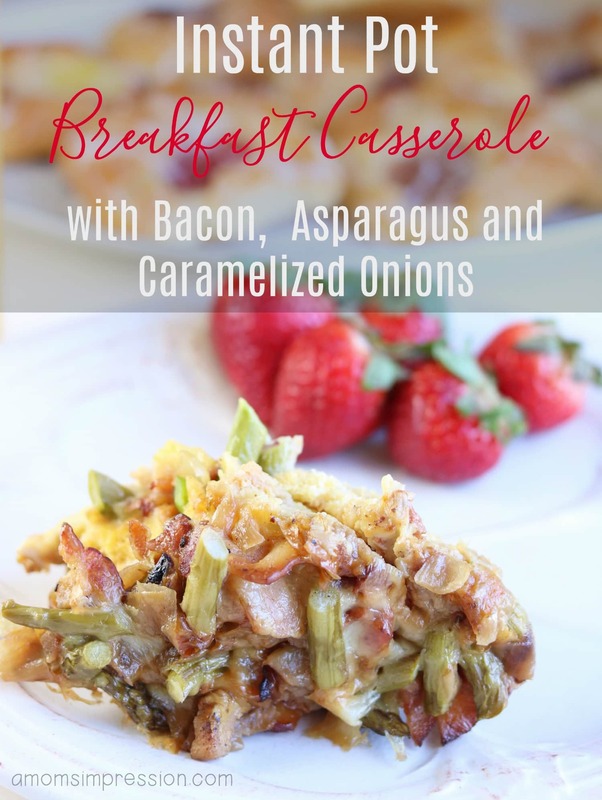 Dinner has never been easier, so I thought maybe breakfast time could be just as easy. 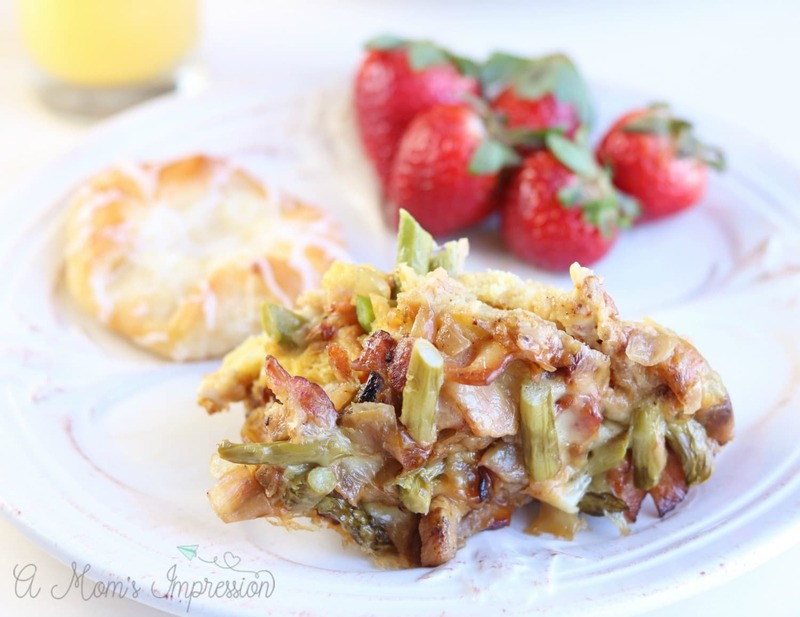 After sucessfully making homemade yogurt in the pressure cooker, and a version of my grandma’s pull apart monkey bread, I decided that it was time to take it for a spin with a tasty breakfast casserole. 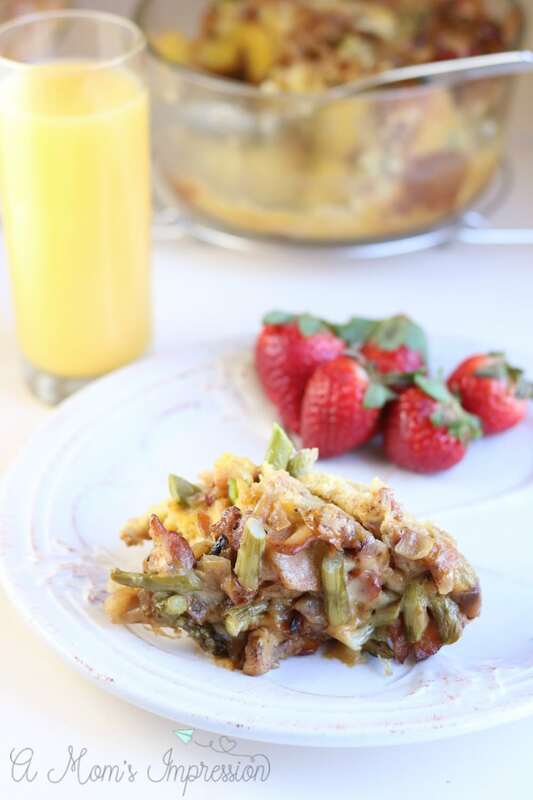 We love healthy and quick breakfast options for the morning time. 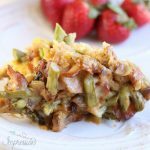 This Instant Pot Breakfast Casserole with Bacon, Asparagus and Caramelized Onions would be perfect for a Sunday brunch or even a special Mother’s Day breakfast in bed. I think it would be perfect paired with Instant Pot Banana Bread for mom! If you are new to pressure cooking and are a little intimidated, don’t be. 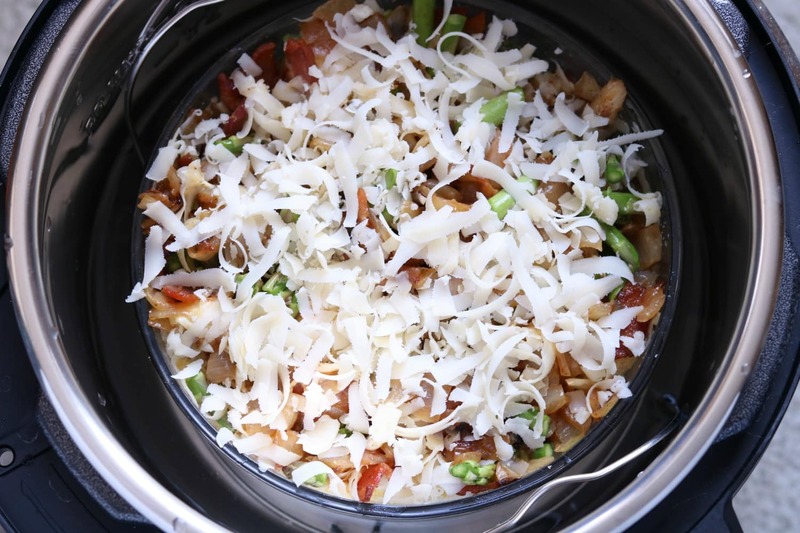 There are many benefits to cooking with your Instant pot, check out our pressure cooking guide to learn more! Don’t have an Instant Pot? Enjoy all the benefits and get yours now! Set Instant Pot to sauté, medium heat. Add bacon and cook until crisp, then remove. While cooking, whisk the eggs, cream, salt, and pepper together. 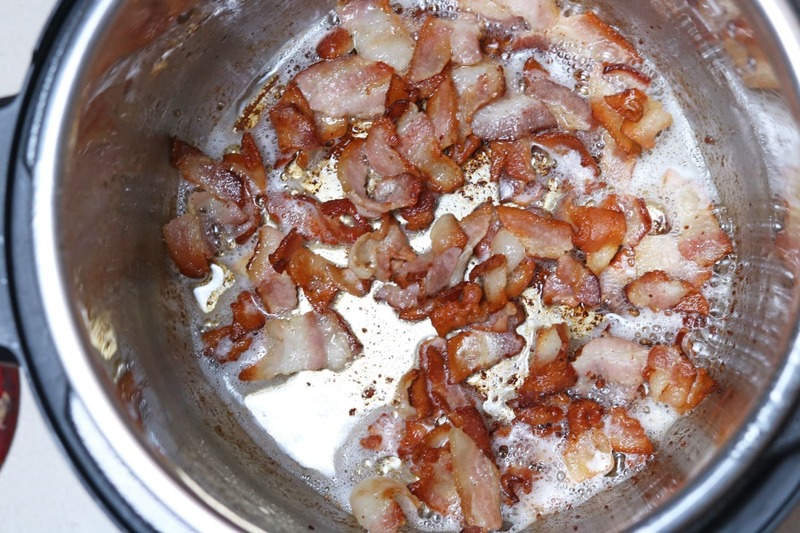 Reserving approximately 1 tablespoon of the bacon fat, add the chopped onion and sugar. 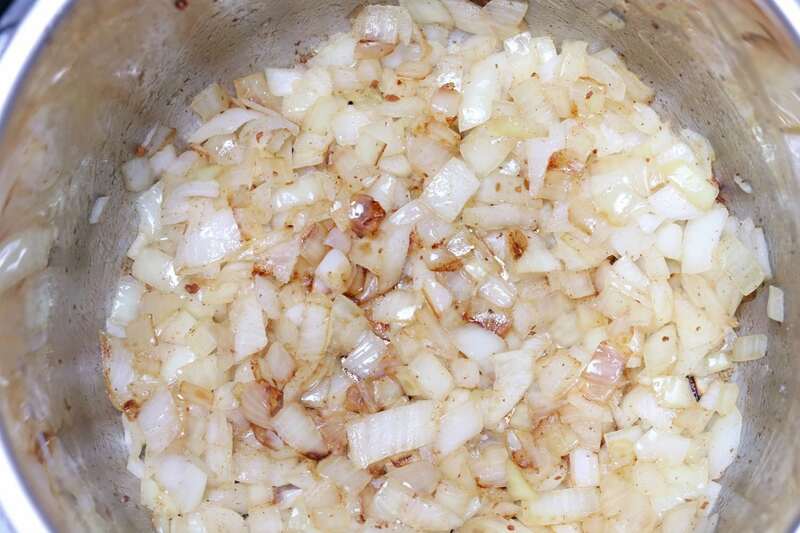 Stir frequently until onions are caramelized, remove the onions and give the inner liner a quick rinse and scrub. Return the liner and add about 3 cups of water. Coat the inside of a 7 cup Pyrex bowl with butter -a similar dish will work as well. Slowly pour egg mixture over the layered ingredients, and then top with cheese. Using the included wire basket, carefully lower the strata into the Instant Pot. At this point the water should come up to about the half-way point in the cooking dish. Seal the lid, set to pressure cook, high, 20 minutes and press start. When finished, let the Instant Pot naturally release for 10 minutes, then press to vent. Carefully remove once the pressure is reduced and serve. Set Instant Pot to sauté, medium heat. Add bacon and cook until crisp, then remove. Return the liner, add about 3 cups of water, and set to pressure Cook, high, 20 minutes. Using the included wire basket, carefully lower the strata into the Instant Pot. At this point the water should come up to about the half-way point in the cooking dish. Seal the lid and press start. Let the Instant Pot naturally release for 10 minutes, then press to vent.